For this easy roast chicken, we use the most minimal of ingredients: just olive oil, salt and pepper and a bit of stock or wine. When so few ingredients are used, it’s essential that those ingredients you do use are of the best quality you can afford. A good pasture-raised chicken can average between $12 and $25, and while the initial price point might make you balk – especially if you’re used to the prices of conventionally raised birds which often sell for as little as $.79 / pound at the local grocer. Pasture-raised chickens are raised outdoors with free access to a natural diet of bugs, grubs and sprouts. Fresh water, clean air and an optimal diet ensure that their meat is richer in nutrients – particularly fat soluble vitamins like vitamin E and vitamin A. 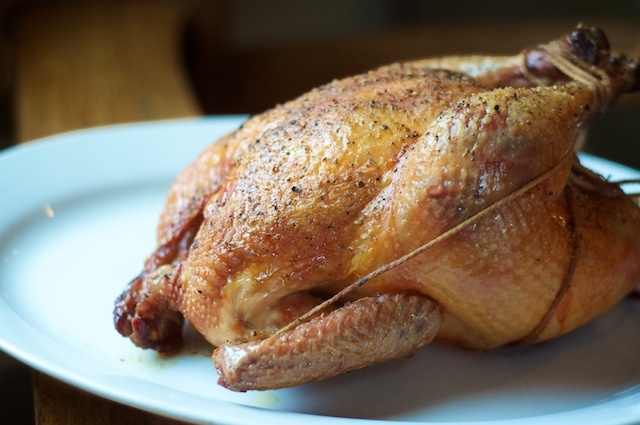 Moreover, the flavor of the birds is richer and more pronounced than that of conventionally raised birds and, when making an easy roast chicken of only the simplest ingredients, the flavor of a pasture-raised bird can truly make the dish. The active preparation time in making an easy roast chicken is likewise, minimal. Pasture-raised birds, because they’re more active than conventionally raised birds that our confined to battery cages or overcrowded chicken houses, tend to have tougher meat. For this reason, pasture-raised birds are best suited to long and slow cooking methods. While slow-roasting a chicken at low temperatures before increasing the heat to achieve that lovely golden-colored skin may take extra cooking time, it does not require additional active preparation time. So make this easy roast chicken when you know you’ll be at home with plenty of time to allow the bird to slowly cook through, but still wish to put minimal effort into your supper. Dressing a pasture-raised bird with minimal ingredients enables its rich flavor to shine. Slow-roasting ensures that the bird is fall-apart tender. Good food takes good time and while the hours you spend tenderly slow-roasting the bird are long, the active time in the kitchen is minimal. Rinse the chicken and pat it dry before trussing it with 100% cotton cooking twine. Drizzle olive oil over the chicken and sprinkle the bird generously with unrefined sea salt and freshly ground black pepper. Place the trussed and dressed chicken into a clay baker or baking dish, adding ½ cup stock or white wine to the bottom of the pan. Turn oven to 275 degrees Fahrenheit and roast the chicken, covered, for about three hours. Increase the heat to 375 degrees Fahrenheit and continue roasting for about thirty to forty-five minutes. Remove from the oven and allow the bird to rest five to ten minutes before carving and serving. Save the chicken’s frame to make roast chicken stock. Do you keep the cover on during the last 30-45 minutes? Thank you for this wonderful post! I do keep it covered for the entire cooking period – and the skin crisps and browns beautifully. I love me a clay baker. Thanks! Could I do the same recipe/time in a slow cooker? I’ve never made it in the slowcooker, but I think it should cook fine. You might miss that lovely crispy brown skin, though. Just don’t put it in the slowcooker before work and come back home 8 hours later to an INCREDIBLY dry chicken. lol I need to get a slow cooker with a timer for things like this. Sounds like the temp was too high and the liquids too low – for really long cooking, I usually stuff the cavity with a quartered lemon and onion and increase the stock or wine. This compensates for any steam loss. Although I’m not sure I’ve gone over 6 hours… don’t recall. I love making a roast chicken for the family on the weekend. It is so easy and the oven does all of the work but it tastes as if you have been slaving over it all day long. Is there a nutritional reason to bake the chicken for so many hours? I make a simple chicken by cooking at very high heat, 425 degrees for an hour. If it is laying down on a rack I turn it half way through so both sides get browned. It could take a lttle longer if the chicken is cold when it goes in but it is done when you can easily separate a leg from the carcass or twist the bone inside the drumstick. Sometimes I do this in a cast iron roasting pot and sometimes in the open on a rack. The pot preserves the moisture that can be used to flavor other things whereas the drip pan under the rack gets you a totally reduced consomme that is also useful. Cooking meat at high temperatures alters the chemistry of the meat and is a contributing factor to cancer. A new book, just out, called Breast Cancer: Reduce Your Risk with Foods You Love by Dr. Robert Pendergrast has a chapter which talks about cooking meat at lower temperatures to lower your risk of cancer. I totally agree with Tom. There’s absolutely no reason to cook a chicken for 3-4 hours, pastured or otherwise. I use to cook regular chicken pieces in 25 minutes in the oven at 375. I hate over cooked, dried chicken, but since my pastured birds have turned out tough, I decided to try this method. At 2 hours I went to check on it and the bones separated from the meat and the wing fell apart. Then I left it uncovered and raised the temp to 375 to crisped the skin. It was the driest chicken I ever had. I’ll admit, I was cooking chicken pieces and not a whole chicken, but I’m positive that those chicken pieces would have been done in 45 minutes covered like that in a clay pot at 275. Well … since you didn’t actually try the recipe, your results wouldn’t be the same now would they? I agree with you Jenny; I just tried the recipe and cooked exactly the way you said to. I just took it out of the oven and it is perfect! I’ve never had such a juicy tender pastured chicken and I’ve been cooking them for several years. I had almost given up on getting them since they were so “chewy” and usually rather dry. Thanks so much. I eat so much roast chicken my girlfriend thinks I’m insane. (Except these days, when I’m more likely to throw a couple on the grill!) I’d also suggest stabbing a lemon all over and placing it in the chicken’s cavity. This way it automatically bastes while cooking, keeping the bird nice and juicy without you needing to tend to it every few minutes. Oh yes! We LOVE roast chicken done that way. The lemon really does wonders to keep the chicken moist. And another trick we do, is to separate the skin from the flesh and rub herb butter between the skin and the breast. I’ve never trussed a chicken. Would you be able to do a post about the how-to of chicken trussing complete with step-by-step photos (I’m very visual)? If not, will you please direct me to a good source to learn this valuable art? I covered it in the online cooking class, but might cover it here too because it’s such a good technique. To describe it though: 1) tuck the wings behind the chicken’s back, 2) wrap twine around the chicken’s legs, 3) take the twine over the thighs, behind the wings, crossing at the back and bring it back under the thighs to the legs again, 4) tie it off at the legs. And … come to think of it … it probably really does need a photo-tutorial. I looked up the same thing, but I googled it and found a good video tutorial. Hope that helps. Heating up my kitchen in the summer is no fun, so I throw the whole chicken on the grill! Pastured birds can be *So* tough, but this one is amazing. .My little guy ate a leg down to the bone, literally – nothing left but the bone. As for meat recipes – I don’t have a lot of pork but this is an awesome beef pot roast: https://nourishedkitchen.com/beef-pot-roast/. I LOVE simple recipes. That is actually why I don’t follow recipes that often – because my favorite meal consists of throwing a bunch of food in a big bowl, lol. It may have a lot of ingredients but I truly throw in whatever my eyes see first in the fridge! If we don’t spatchcock the chicken we buy tomorrow at the farmers market then we will have to roast the chicken this way!! Mmmm … I’m hoping to do spatchcock chicken tonight. That is seriously yummy stuff. So do you leave all of the innards inside the chicken while it roasts? My pastured chickens come from a local farm with everything but the intestine still inside…so that alone takes me more than 5 minutes to get everything out, rinse, pat dry, etc. I’ve never had a pastured bird arrive with its innards still intact. Usually, you have to ask for those, the feet and the head. But, yes, if your bird does arrive like that you’d need to remove them and give the cavity a good rinse. Question: In your method, could a large dutch oven be used instead of a clay baker? Will the skin still crisp? In my experience with this recipe, yes, and no. For crisp skin remove the lid for the last part of cooking, but be careful that you don’t dry the whole thing out trying it! I don’t have a clay baker. I’m not even sure my ceramic casseroles are large enough for a chicken. How do you think this would work with a covered Dutch oven or a domed covered braising pan? I’ve browned, then slow baked (250°F) whole chickens for 2 hours in the covered Dutch oven or braising pan (a la Cooks Illustrated “French” chicken in a covered pot method) which still wasn’t long enough for older & tougher “backyard” chickens, but does a super job on Trader Joe’s organic chicken. I hadn’t ever thought to bake for 3 hours. Also, the covered Dutch oven method doesn’t crisp the skin as it holds in too much moisture – I suppose the clay baker does a better job creating crisp skin because of the porous nature of the clay. Hmmmm yum… I’m going to get my wife to cook this for me tonight.. thanks for the useful recipe. That chicken looks delicious. Your effort to help keep time in the kitchen to a minimum is appreciated. Thanks for this post. Do I put the chicken on a roasting rack in the pan? Or just let it sit on the bottom of the pan? I’m so excited to try this later today!! I let it sit in the bottom of the pan – and it works great. I imagine you can put it on a rack and be it’ll be even better. Let me know how it goes. We made it last night. SO yummy. Do you have a link where I can buy a clay baker? Thanks! I am making this for dinner guests tonight! My house smells heavenly and I learned how to truss a chicken; a skill that I am sure will enable me to escape the zombie apocalypse alive and well. The chicken turned out AMAZING! So moist and delicious! I added a granny smith apple to the cavity for a special fall touch. Made this tonight (with roasted acorn squash and green beans w/bacon) and it was delicious! I’ve never done the slow roasting before, always did it at higher heat for less time. Yum yum! And tomorrow, making stock…. perfect for a snowy winter day! I’m a newbie- why does the chicken have to be trussed? I’ve made this multiple times without trussing and it turns out so delicious (which is why I keep making it). Also, I’m using my stoneware (pampered chef)- is that different than clay? And why do I need to dry the chicken before baking? Thanks for answering. Crystal- Trussing a chicken will help the wing tips not dry out and the meat cook more evenly. That being said, I usually skip the step. I love roasting chicken in my pampered chef stonewear. Drying the chicken before baking will help the skin crisp up. That all being said, I just bought my first pastured chicken so I’m excited to learn that you should cook it slow before I went and cooked it the way I usually cook chicken. Thanks! I have a book on grass-fed meat that I’ve started to read but I’m not sure it covers chicken or if it all beef. @Amanda, I was just thinking I could roast in my stoneware…how do you do it? I have a large 9×13 deep dish and a deep roaster…I know they can fit together to be a roaster. Wouldn’t that work? Thanks for sharing this recipe! I’m so glad I found it, instead of just trying to roast a pastured chicken the conventional way. I just tried it tonight. I had an almost 5 pound pastured chicken from the farm co-op I belong to. I roasted the chicken in a Le Creuset dutch oven with lid (with some potatoes and carrots tossed in) for 3 hours at 275F, and 30 minutes at 375F. Unfortunately, this came out too dry, and the temp reading I took at the end was a little over 200F. Yikes! I’m wondering if I could’ve just skipped the end step of raising the oven temperature to 375F. The chicken didn’t brown much, anyway. I will definitely try it again, but will adjust the times and temps. I wonder if the cast iron holds more heat than (more porous) clay? I use a dutch oven and don’t change the temp unless I have to open the oven to remove the lid to brown the skin, since heat is then lost. Where did the internal temp of 180*F come from? I’ve always used 165*F for poultry. Wow, this is great. I had just picked up a pasture-raised chicken, and roasted it the typical way I always have. The family was NOT impressed. I am excited now to try it again, your way! Thanks again. I do a semi-slow roast (for 2 hours)…but ALWAYS roast breast-side down…no trussing involved. Breast meat stays juicy and tender this way. I stuff the cavity with an organic apple for a lovely flavor…rosemary and thyme all around and some sliced shallots and garlic to boot—it has never let me down! I agree that fresh, free range birds are the tastiest! We are raising our own this year! Is this viable with range/stewing hens? I’d love to add a non-soup way of cooking these birds, since they’re delicious (and I suspect much better than even regular pastured chickens) but so tough. When making soup I have to let it simmer a good 2-3 hours before the flesh even thinks about coming off the bone. I have a chicken roasting in the oven now. It’s my second time making this recipe and it didn’t disappoint the first time. I love how it is simple, yet so elegant; plus the minimal prep leaves me plenty of time to make nice side dishes for a beautiful meal. I’ve made this twice now and both times are SO good. Today I brined my chicken for about 4 hours before roasting it and it is so moist! I flavored it with lemon zest, celery seed, garlic and plenty of sea salt and pepper. The house is smelling SO good. I just took it out of the oven and it is resting, but I had to take a teeny tiny bite. The bummer thing is I made this for the family but I’m headed out for a meeting and won’t be eating dinner, hopefully they leave me leftovers! Thanks for posting this method because I’d never have thought to cook it so low and slow! Hello. Like some of you I have had a terribly hard time with pastured chicken. We are gourmet experts and producers of local grassfed beef, lamb and pastured pork here in Ocala, Florida. We recently decided to expand into local pastured chicken and duck.. WHAT A HORROR STORY IT STARTED OUT AS! Until now, reading this page! We harvested 250 fresh pastured chickens. My family was so excited that they wanted to be thie first to try them. The weren’t in the chiller two hours, had the processor vacuum seal them, and with such pride in my step, I walked into my house with our new product! A little salt, pepper, paprika and olive oil rub, and into the oven. I sent a couple out to some of our chefs that buy our products, and the same thing, one replying… What is it??? I’m talking to chicken people thinking something might be wrong with my chickens! But what could it be? They’re pastured (rotating), 8 weeks old, hormone and antibiotic free, they looked phenominal, the carcasses were unblemished. Everyone, including the USDA processor was amazed at how beautiful they looked. I finally decided to do what I should have done in the beginning….. GOOGLE ! So, I googled, Why are pastured raised chickens tough? …and here was your site! THANK YOU! In my oven, right now after the chicken sitting in the frig vacuum sealed for 6 days (processor guaranteed freshness for 14!) @ 275, covered, with a butter, salt pepper and paprika rub, is a three lb chicken for 2 hrs 50 minutes. I’m excited again, thanks to you! I use this recipe so often that I just wanted to say, thank you!! There is something so wonderful about the simplicity and deliciousness of a roasted chicken. No fancy herbs, no truffles, nothing hard or hard-to-find. Yet such a warm, nourishing meal. And the smell of the roasting bird is amazing on a rainy, gray day! Thanks for this! Looks delish!! Quick question: is there any reason to be concerned about the smoke point of the olive oil and the 375 oven temp? Is there any reason why you can’t brown first at high heat and then slow cook until desired temperature? It’s better done this way. I would just use a electronic meat thermometer. Cook to 165 in the deep breast. Remove and rest for 30 minutes. A four pound bird is done in 45 minutes at 425. I also use coconut oil because it takes the heat. Olive oil is rancid at 140 degree. No. Olive oil is not rancid at 140 F. And a long slow roast results in an incredibly succulent bird, something you may not know or understand if you haven’t actually made this recipe. The smoke point of olive oil is 325 – 375F so assume this would be ok to use? Good point! lol 275 is a great temperature. I do add a bit of water to the bottom – seems to give more juices for gravy. Either way … water or not…. so juicy …. never have had dry chicken! Higher temperatures – I have! 1/2 lemon and small onion inside is nice. Salt and pepper outside or seasoning salt. Cover and enjoy in 3 hours. I always check with my meat thermometer, just to be sure. This was A MA ZING. Thank you Jenny! does this FAB recipe for roast chicken need to be the covered clay roaster or would my square roaster be sufficient? Thanks. My chicken is 7.1 lbs. How would it change the cooking time? I made this in a clay cooker. The skin was incredible. But only the top part because the bird was more than an inch deep in liquid. I put in a half-cup of stock and then the bird added its own juices. The chicken in your photograph looks beautifully browned all over. How do you get the bottom part brown? Do you use a rack in the cooker? Here in Switzerland the biggest chicken we can buy is only about 2.5 pounds. How would I adjust the cooking time? Don’t laugh, I’ve never cooked a whole chicken so I’m asking because I have no idea what to do. Do you remove the innards? Hi Jill! The innards aren’t typically included with most purchased chickens. Occasionally, you might find a bag inside the chicken’s cavity that contains the heart, gizzard, liver and neck. You can reserve these, if you like, for gravy, or discard them. 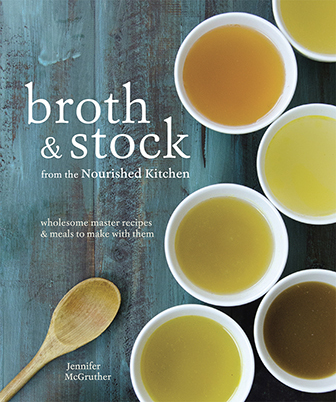 Jenny – is there a reason why you don’t use the innards in your broth? I’m excited to have stumbled upon this, because I just put my name on the list at a farm for a pastured broiler. This is good info and as someone else commented, I have a Le Creuset so I will be watching it very carefully for the correct temp! Thank you for the information!!! I have been following your blog for a while – thank you so much for being so generous with your wisdom and encouragement. There are many foods that I cannot eat right now (I am on GAPS, trying to heal my GI), but even so, I still read your posts because they are so helpful and fun. Please add a print button….I love so many of your recipes – I would love to quickly print them! My reasoning is two-fold: 1) the organs muddle the flavor of the broth, and 2) one of the reasons we eat organs is for the vitamin content. Vitamins are heat-sensitive and would be largely destroyed through the prolonged cooking required to make stock. Better to save your organs for something like pate. Read this last night and had to go pull one of our birds out of the freezer to roast this morning. I will do it exactly but add a clove of heirloom garlic and a stem of rosemary to the cavity. Today I pick up some Bres de Poule chicks, that are suppose to be the most delicious meat chicken available in France. So excited to get started with this breed and see how it does in Texas ! Thanks for the inspiration and love your cookbook. I received a clay cooker as a white elephant gift and look forward to making this chicken dish. Do you soak the clay cooker in water before baking? Im also curious to know if the clay cooker needs to be soaked? I am picking mine up tomorrow so never cooked with one before! I have a 9 qt cast iron enamel pot with lid…can i. Use this recipe but put chicken over red potatoes and fresh veggies from the start? That way the juices of chicken and broth and wine infuse into veggies and potatoes. Do i cook with lid on throughout or off??? Let’ssay iit’s a 6 lb bird..
Hi, if adding vegetables to roasting pan, when during the cooking time would that be done. I tried the recipe without veggies the other day and it turned out great. Jenny, are you aware that all the olive oil you use greatly increases your omega-6s, thus further disturbing the ratio between omega-6 and omega-3? The new advice is to reduce olive oil and other sources of omega-6 (never cooking with olive oil, only for dressings) to occasional and use more coconut oil, butter, and omega-3 sources. It’s important to keep omega-6 and omega-3s in balance, and for people eating fish (which should be all of us) and taking CLO, using foods like olive oil is perfectly fine, not only that, it’s optimal. Yes, eat coconut oil and butter, and foods rich in omega-3s, and yes, enjoy olive oil too. I cook mine at 275 – stick 1/2 a lemon inside and small onion inside, and sprinkle outside with seasoning salt. Cover. Check at 2 1/2 hours for temp. Seriously, so moist and tasty. I’ve been doing this for over a year and wouldn’t go back. I’ve never had dried out chicken but I sure did at the higher temperatures. I have a 6 lb pasture raised chicken. How much additional time at 275 do you think the chicken might need? We usually just toss it on the Traeger and follow the same recipe. Hello! 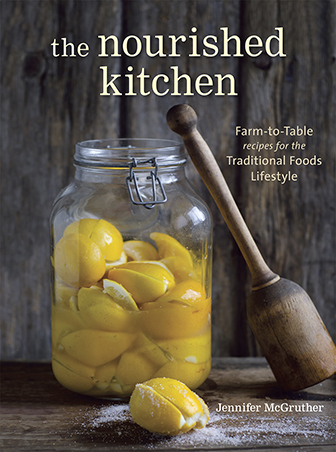 I have so appreciated the recipes and insight you share through your cookbook and website. There used to be a wonderful roast chicken with herbs tucked under the skin as well as ghee and garlic. Do you mind reposting it? Thank you! Hello, I just wanted to try again to find out the right temp/timing for the roast chicken with butter and herbs recipe. It’s one of my favorites (in addition to your apple cider vinegar one). Thank you! I’m assuming you would have mentioned if your clay baker was soaked prior to placing the chicken inside. Maybe this is why your photo shows a beautifully-browned bird on all sides, and why some commenters here found their chicken sitting in it’s own juices. For the record, could you please clarify whether or not you soak the clay baker? Thank you.